59 %. That was the approval rating for Bin Laden in the year 2003 according to Pew Research – not in Afghanistan but in Indonesia, the most populated Muslim country, well known for it´s tolerant, moderate Islam. America was since then involved in two mayor wars, that costed thousands of billions of US Dollars but the success is rather modest. Especially in Afghanistan, where Americans are engaged since a decade, there seems no light at the end of the tunnel. Even if Americans would stay for another decade and spend another Trillion, it´s rather unlikely that Afghanistan would then be a stable country, yet alone a Democracy under the rule of law. One of the main reasons why the West doesn´t succeed in Afghanistan is because we don´t want to look a the root cause of the problem: The Ideology. The Religion. Americans and Europeans are outraged when they read about women being stoned to death, hands being chopped of, and people killing other people just because they consider them to be infidels. This is what the Taliban and El Kaida are doing. But neither the Taliban nor El Quaeda invented Jihad or the stoning of women. „Kill the infidels whereever you find them“ is something that Bin Laden propagated, but it´s not his creation. He just quoted it. It´s written in the Quran. Whenever you link Islamic Terror to Islam people say that most Muslims are no terrorists, that most of them are peaceful people. And this is definetly true. Most Muslims I know are good people and some of my best friends are Muslim. Yet the argument is still wrong. The mistake is that they equalize individuals with their religion. But most Muslims (as well as by the way most Christians) know in fact very little about their religion. But what is deeply inprinted in the mindset of the Islamic world and what most Muslims are raised to believe in, is the conviction, that the world is seperated between believers and nonbelievers, that the believers know the truth, enshrined in the Quran, whereas the infidels are living in ignorance. And then there is the taboo of questioning Islam, a taboo that even secular Muslims don´t dare to challenge. In reality Muslims have to see that the nonbelievers are – despite all their presumed ignorance – far superior when it comes to economic power, scientific progress, productivity, democracy etc. And because they don´t dare to question Islam, they have to flee into conspiracy theories. This is why the vast majority of Muslims, even those who are well educated and are living in the West, are trapped in conspiracy theories. America and Israel are the scapegoats for everything, even for earthquakes, tsunamis, cancer and aids. Conspiracy theories are deemed to be the reality in the Islamic world. Therefore the hatred against America has very little to do with America´s actual politics, but is based on a notion that America as the most powerful country in the world has to be the mastermind in the conspiracy responsible for the inferiority of the Islamic world. Conspiracy theories are not only a problem for the West but most of all a problem for Muslim themselves, because they distract from the real problems and real culprits. When 59 % of Indonesians agreed with Bin Laden in 2003, it doesn´t mean that 59 % of Indonesians were terrorists, not even that they were bad people. But it demonstrates how dysfunctional many Islamic societies are and how much they are influenced by Islamist propaganda. Islam, at least certain doctrines of Islam, are a challenge for the West, but they are even a far superior problem for the Muslims living in the Islamic world, most of them living under repressive political regimes and depressing economic conditions. Democracy, Human Rights, Rule of Law – all these civilisatory milestones are based on the capability of rational, enlightened, critical thinking and not on the worldview of the 7th century of the Arabic peninsula. We have to stop following the illusion that Islam is only a transcendent religion and doesn´t have a political and legal dimension, which are both not compatible with human rights and democracy. We have to make a clear distinction between Islam as an ideology and Muslims as individuals, who are capable of rational thinking and going through a period of enlightenment like Europeans did. Most importantly we have to start engaging in a battle of ideas, countering the Islamist propaganda, funded with billions of petrodollars. And if we are determined, we could easily win this battle, because we have the better arguments by far. A member of the Muslim brotherhood would rattle about the superiority of the Islamic world but even he would be using a PC, invented by Americans, Internet, invented by Americans, mobile phones, invented by Americans. Muslims deserve that we treat them with respect, but that means that we tell them the truth. We live in a time of science, where technological progress is staggering. We should explain to Muslims the most basic scientific facts: That a place in Saudi Arabia is not the center of the Universe, that the sun doesn´t rotate around the earth, and that evolution is more than a theory. We have to study Islam, it´s numerous contradictions to human rights and scientific facts and get into a discussion with our Muslim fellows. The key to win this battle is enlightenment. And enlightenment has to start in schools, with education that emphasizes on rational, critical thinking, especially with regards to politics and religion. And we have to acknowledge the fact that we do have a problem – not with most Muslims but – with Islam and the ideology of Jihad. 10 years after 9-11 we have to learn the lessons. We owe it to the victims of 9-11, to ourselves and the generations to come. 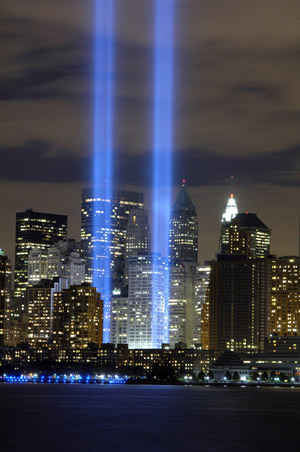 May the victims of 9-11 rest in peace. Grüße, und mögest du weiter so erfrischend bloggen! Vielen Dank für das Lob und danke für den Hinweis auf deinen Blog, wirklich super geschrieben, sehr fundierte, wissenschaftliche Analysen. Freue mich deine Artikel durchzulesen und deinen Blog in Zukunft näher zu verfolgen!